This is my second recent attempt at macaroni and cheese. For the first attempt, I used a pound of whole wheat macaroni and doubled a cheese sauce recipe. It was just a shade too much for my small casserole dish (but not enough for the larger one), and it came out on the dry side, but it was tasty enough for me to work on again. I had to wait, though, while I waded through the first batch. It's a good thing I like leftovers. While I was working on those leftovers, I started thinking about my cooking habits. I grew up in a large family so I got used to cooking in large quantities. Even though I am no longer cooking for seven, and haven't been for a long time, I still cook enough to feed the proverbial army when I make certain things. I tend to cook in package quantities. When you're cooking for one or two, a pound of pasta easily makes a week's worth of lasagna, spaghetti, or mac and cheese. A head of cabbage makes a mountain of cole slaw. While my knee-jerk reaction is still to cook certain items in large quantities, I am starting to be more conscious of it and I have been able to scale back on many of these dishes. Instead of using a whole head of cabbage for my slaw, I only use a portion of it, and then I find another use for the rest of it. While it was necessary to use two cans of tuna when I made tuna salad in the past, one can works just fine for me. And, most importantly to me (and for some reason the one around which I had the most trouble wrapping my mind), I started measuring out my pasta by the cup instead of by the package. 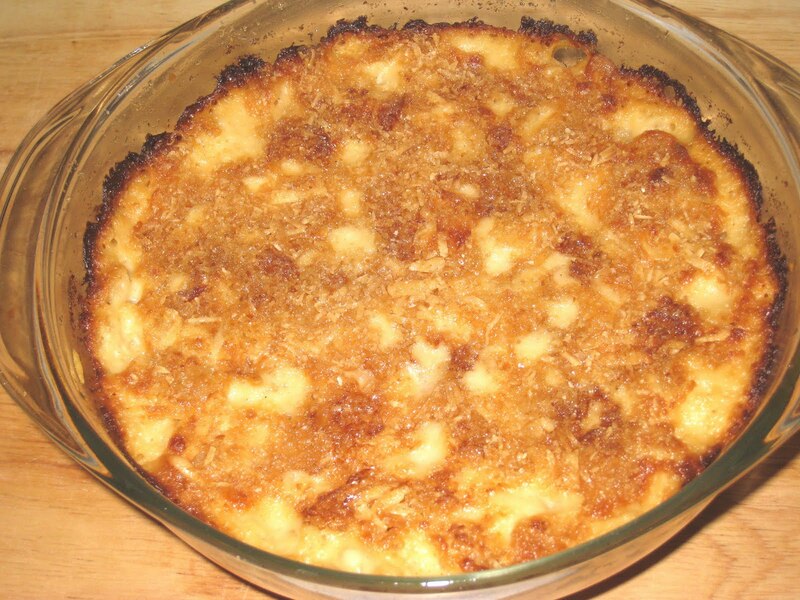 Which is why, when I decided to try my hand at mac and cheese again, I decided I could halve the recipe, which would still give me leftovers, but only for a few days instead of for the rest of the week. It was easy to cut the ingredients in half. Because so much of savory cooking is a matter of taste, it is easy to cut back on ingredients. I will admit that it's hard to do in baking, when you have to try to cut an egg in half (but it is not impossible), but when you're talking about cheese, or meat, or vegetables, it won't ruin the dish if you have more of one thing or less of another. It's all pretty much a matter of taste anyway. Cutting this mac and cheese recipe in half worked extremely well. It provided four generous servings that lasted me a few days. I was even able to skip a day without running the risk that it would go bad before I could eat it all. And it was easy and delicious. It takes a little longer to make than the packaged versions, but it is just as easy and tastes much better. And I know exactly what has gone into it. And if you do want to feed an army, it is easy enough to double the recipe. Preheat the oven to 350 deg. F. Grease a 1-1/2-qt baking dish. Cook the pasta 1 to 2 minutes less than package directions and put in a mixing bowl. Stir in about a tablespoon of cold water, to keep the pasta from sticking. Prepare the cheese sauce and add it to the pasta, stirring it together. Add the grated cheese and mix well. Season to taste with salt and pepper. Pour the mixture into the greased baking dish. Combine the melted butter, breadcrumbs, and parmesan cheese and sprinkle over the top of the casserole. 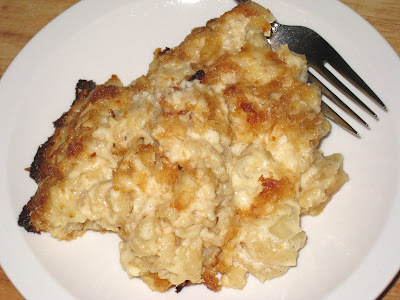 Bake covered for 30 minutes, then uncover and bake another 30 minutes to brown the cheese and breadcrumb mixture. milk. Stir briskly until the sauce is thick and smooth, then repeat the process with the remaining milk. Continue to cook stirring frequently, until the sauce is thick enough to coat the back of a spoon. Remove the sauce from the heat and stir in the cheese, mustard, cayenne. Season to taste with salt and pepper.